The SNP's long-awaited Sustainable Growth Commission Report is finally available. 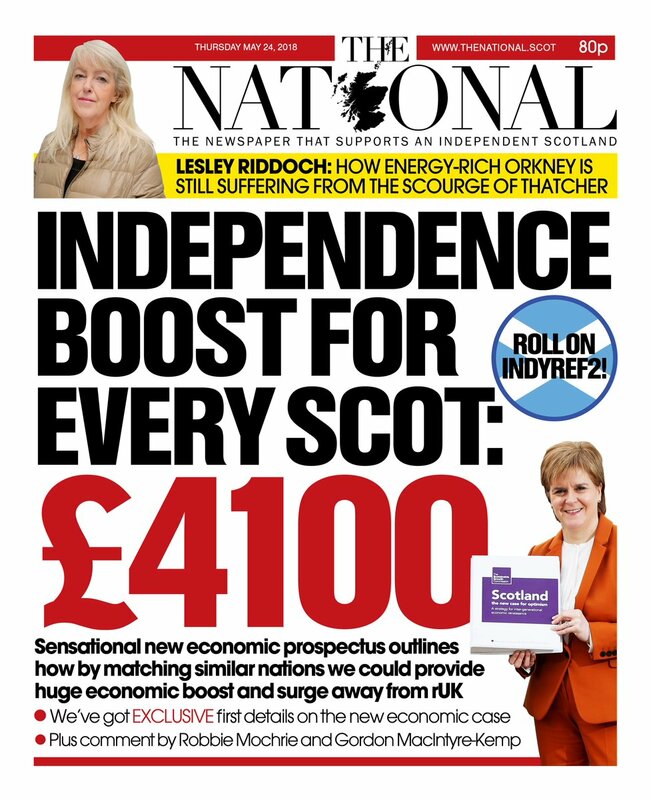 I've already blogged on the pre-release headline spin about a "£4100 boost for every Scot" here, but now I have the full report to hand I can offer a more complete analysis. It sees what lessons can be learned from looking at their chosen benchmark of "small advance economies"
The first of these we'll come back to in future blogs, but suffice to say if you read pp 154 - 160 of the report there's an awful lot there that than can be done now, with the powers the Scottish Parliament already has. To be fair the biggest single recommendation is probably the one about attracting more inwards migration to Scotland, which would require further powers to be devolved to the Scottish Government. I predict a long discussion to come about the desirability and practicality of that and, for what it's worth, I personally remain open-minded and look forward to that debate. In this blog I want to focus on the second of the above, namely how they've scaled the economic upside and whether that analysis is robust. I should be clear that by critiquing the analysis I'm not critiquing the specific growth recommendations. I'm focusing here only on understanding how they've arrived at the "purely illustrative" figures they've used to scale the potential and to ask how reliable those figures are. "If Scotland were to be added to the list of 12 benchmark small advanced economies, it would be 12th out of 13 in terms of GDP per capita. The median of this group is 14% higher than Scotland, a gap of $5,500 (£4,100)"
I've recreated the analysis - it doesn't take long, the source data for the benchmark countries can be found and downloaded here and for Scotland the data can be found in the latest GERS report here). There's nothing like recreating a piece of analysis to expose how simplistic it is. I know, right? 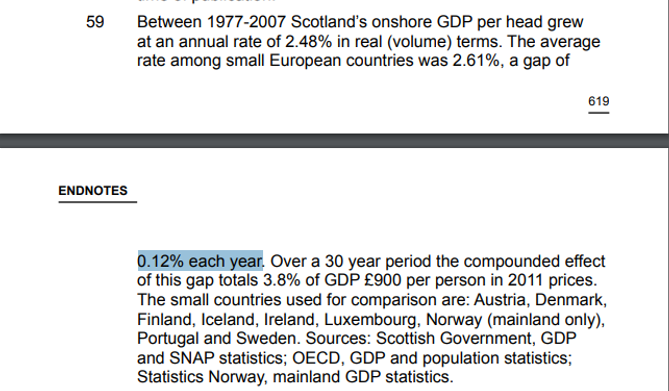 The headline figure from this 354 page report is based on nothing more sophisticated than saying "if we had the same GDP/Capita as the Netherlands we'd have £4,100 more GDP per capita." To illustrate how flaky this figure is: they could have decided not to include New Zealand and Belgium in this list (it is after all an entirely arbitrary selection) and the median country would become Sweden - if our GDP per Capita matched Sweden's we'd have 25% higher GDP or £7,250 per person. Yay! I'm sorry, but using this type of "analysis" to scale the GDP per Capita potential of an independent Scotland is pseudo-scientification of the worst kind. So why scale the potential by comparing our GDP/capita with the Netherlands? Because if you compare our GDP/capita to the [mean] average of the three countries mentioned above, it would suggest an increase of only 7%, half the amount used to get to the £4,100 GDP per capita figure (used in the headlines. To be clear: that would translate into an aspiration to achieve additional tax revenues of c.£4.5bn pa, less than half the amount we would lose from the Barnett Formula driven fiscal transfer on day one! 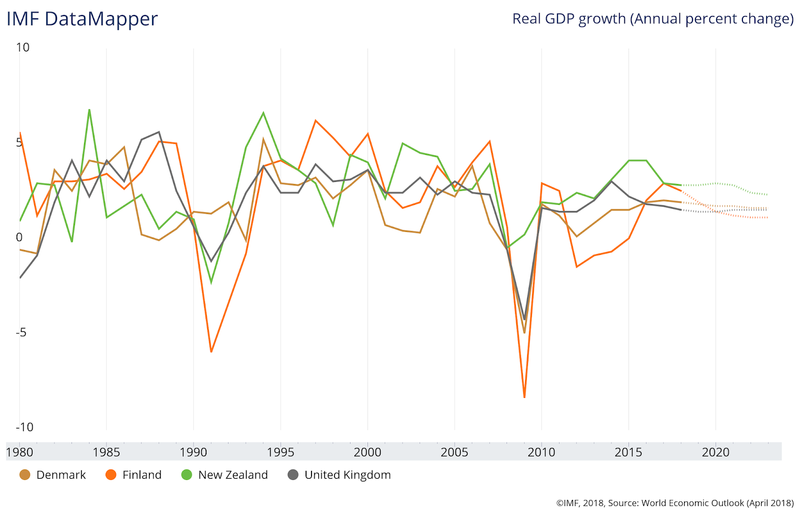 In fact, as the chart above clearly shows, New Zealand's GDP/Capita is lower than Scotland's - which kind of highlights the ridiculousness of this particular "if we were the same as them" analysis. It seems clear to me that this "GDP/capita gap" nonsense was retro-fitted to this report to force out a palatable and tabloid-friendly headline. So what about the analysis that's used to justify the conclusion that, if we can learn from this cohort of countries, we can expect to achieve GDP growth that would be 0.7% superior to that of the rest of the UK? Note that this assumption is absolutely critical when it comes to determining the timescales involved - the time it would take us to claw back what we know we'd lose from UK-wide pooling and sharing on day one (the net fiscal transfer of around £10bn pa that comes to Scotland as a result of the Barnett Formula). The good news is that we can find the IMF data used to reach these conclusions here (you can thank me later). Let's talk first about the 12 countries that have been selected as the list of "benchmark small advanced economies". There doesn't appear to have been an objective criteria applied to arrive at this list, and the extent of its subjectivity is perhaps best illustrated by looking at the list of "small countries used for comparison" when similar analysis was published in the Independence White Paper (page 620) back in 2013.. The Scottish Government analysis in 2013 concluded that the superior GDP per Capita growth rate enjoyed by those countries that had "the bonus of being independent" was just 0.12% greater than Scotland's onshore economic growth over a 30 year period. That's quite a way short of the 0.7% we're now expected to believe we should expect, is it not? Firstly the set of countries used for comparison is different - out go Iceland, Luxembourg and Portugal and in come Hong Kong, Singapore and Switzerland along with Belgium and the Netherlands. 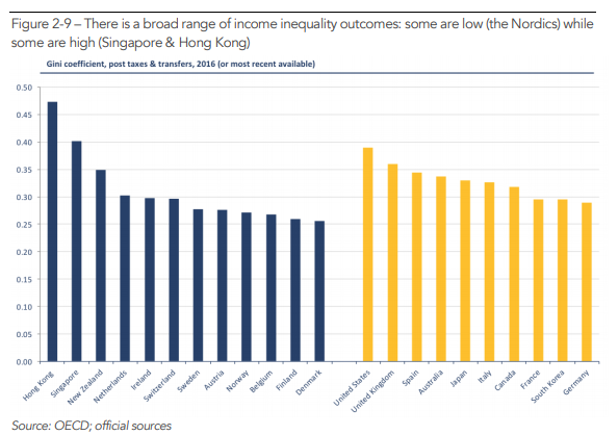 The addition of Hong Kong and Singapore is particularly noteworthy as they significantly raise the average growth rate for this cohort but they are - as the report concedes - countries with appalling levels of income inequality. It's hard not to conclude that those countries were included to boost the average growth figures of the comparison countries - they certainly aren't countries with socio-economic values consistent with those voiced by the Growth Commission. 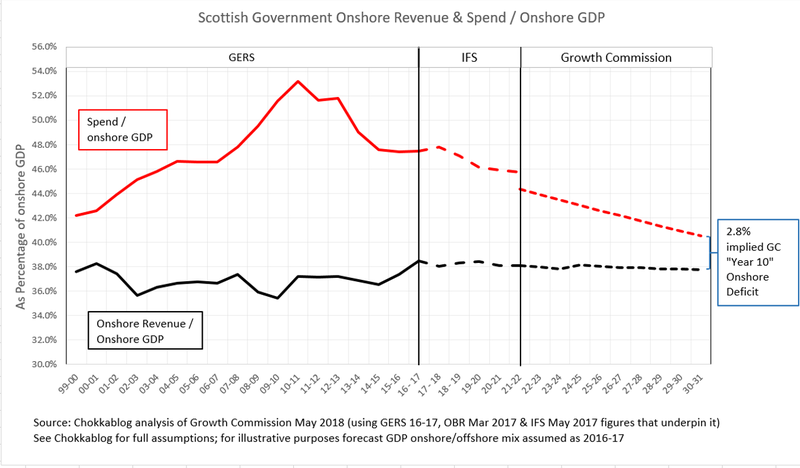 The other significant change is that the White Paper looked at onshore economic performance only, whereas the Growth Commission is looking at overall economic performance including Oil & Gas. I can't be bothered to work out how that affects this analysis to be honest, but mention it in case others have the necessary enthusiasm to recreate the analysis separating onshore from off-shore performance. So can we recreate the 0.7% figure? 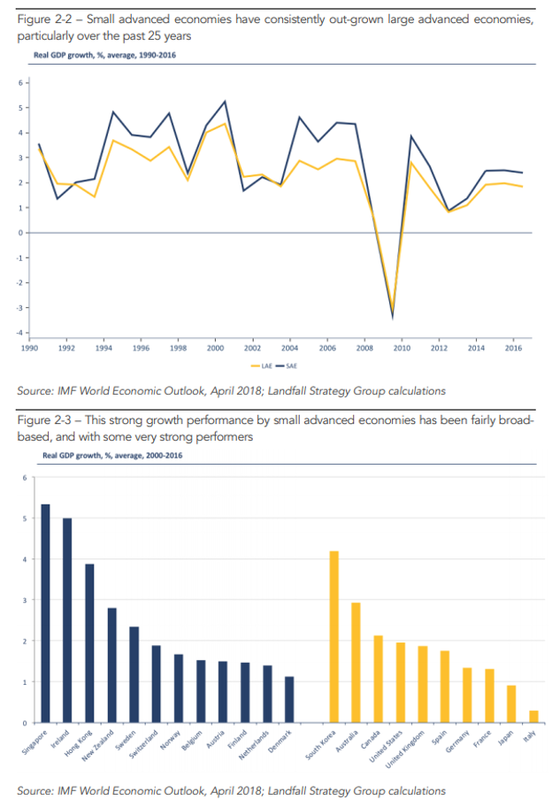 "Figure 2-2 shows there has been a a distinctive edge of around 0.7% of GDP growth in small advanced economies over the last 25 years compared to their larger counterparts"
If the number 0.7% jumps out of figure 2-2 for you, you're better at visually interpreting data than I am. I include figure 2-3 above because I presume this shows us (on the right hand side) the countries included in their "large advanced economies" list. We should now be able to recreate the 0.7% figure and see how sensitive it is to which countries are included or excluded. Notice that the graphs above cover different time periods: 1990 - 2016 (referred to as "the last 25 years") and 2000 - 2016 for the bar charts. Looks spot on to me apart from a superior average growth shown for the SAEs on my graph in 2015. 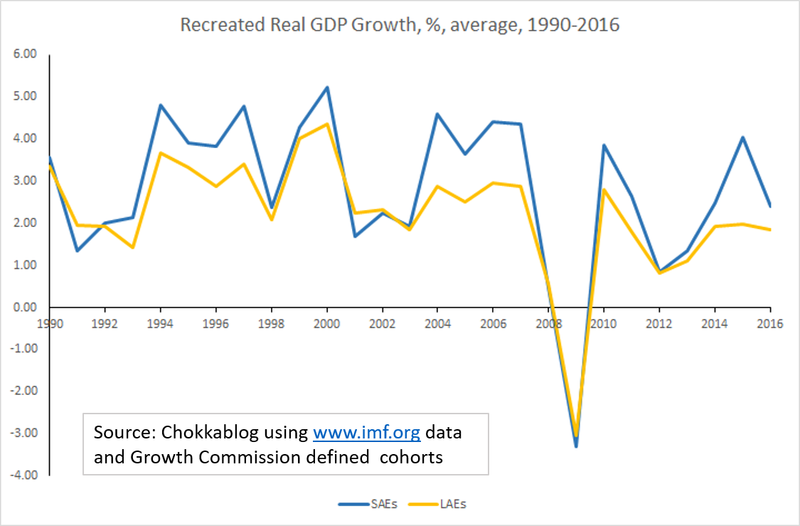 I can't see any problems with the data which I downloaded only today - I suspect the graph in the report was produced over a year ago and the data has subsequently been updated by IMF (but that's just a guess). So, at a pinch, we can see how the 0.7% is arrived at. 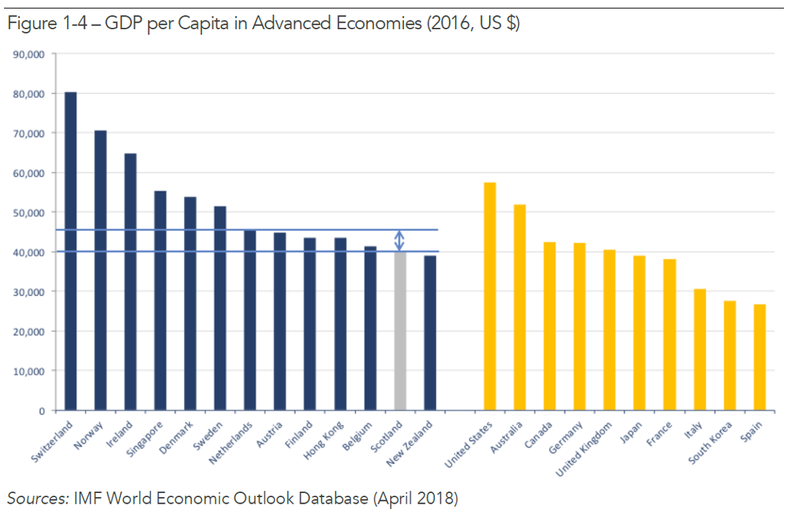 The report scales the GDP per capita growth gap by assuming we match the GDP/capita of the Netherlands and scales the rate of growth we might achieve by comparing us to a cohort that includes the high growth, high inequality countries of Hong Kong and Singapore. But the report actually recommends we seek to mainly emulate Denmark, Finland and New Zealand, countries whose growth rates are not materially different from those of the 'large advanced economies' (or indeed the UK itself). The Growth Commission's "small advanced economy" cohort is arbitrarily chosen and clearly designed to maximise the "growth gap" claim. Does anybody really think Scotland wants to be socio-economically similar to Singapore or Hong Kong? Just removing those two countries from the cohort reduced the "GDP growth gap" from 0.65% to 0.25%. If a 0.25% growth gap is a more realistic long term aspiration - and remember the independence White Paper used 0.12% and the three countries the Growth Commission most seeking to emulate achieve at best 0.06% - then instead of having to wait 25 years to deliver the additional GDP per capita the Growth Commission aspires to it would take nearer 70 years. As the analysis above I hope makes clear, that's still being extremely optimistic based on the empirical comparable data. 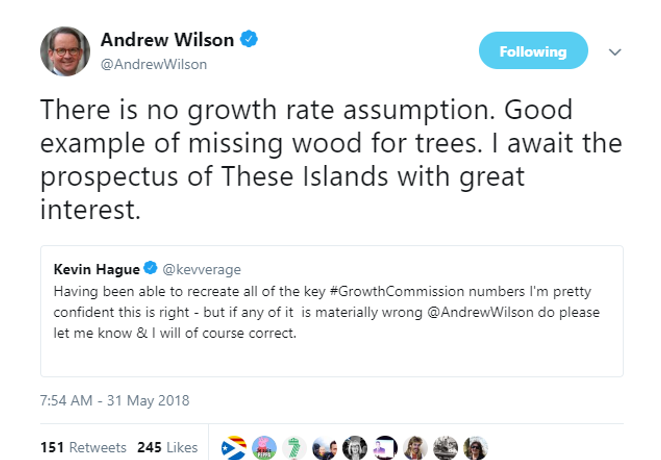 None of this is to suggest that there aren't good ideas in the Growth Commission worthy of serious consideration - but let's not kid ourselves: the numbers used to scale the upside and indicate how long it might take to get there are backed up by very superficial analysis and have been manipulated to show the most positive case possible. I'm writing this before the Sustainable Growth Commission is published and on the basis only of the press releases that have foreshadowed its publication tomorrow. 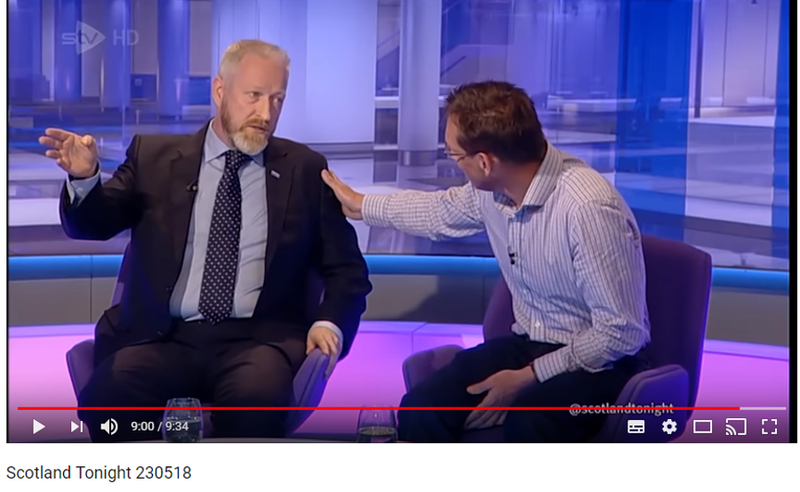 I'd have waited to comment but I was asked onto STV's Scotland Tonight show last night to discuss it (see link below) so had to form a view based on the pre-release hype. Now. We don't need to read the full report to be able to show that this claim - not the report itself, I'm referring specifically to the way this figure has been spun here - is laughably, transparently and desperately ridiculous. Let me explain why. 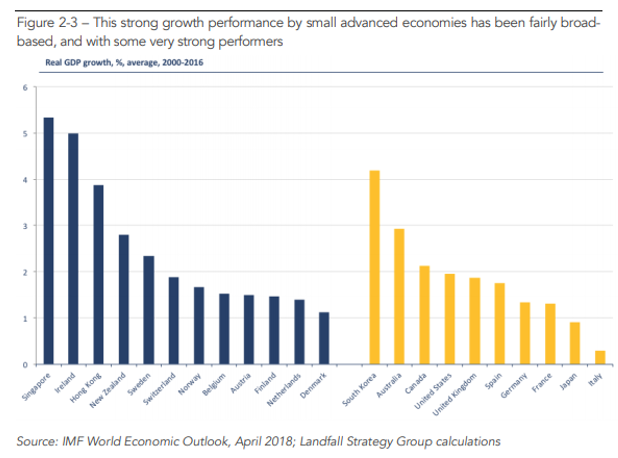 The press release talks about "driving GDP per head" towards the levels of a carefully selected group of 12 "best performing small advanced economies". The release goes on to state "the analysis has shown that small economies* have performed better than larger ones consistently by around 0.7 percentage points per year in economic growth rate, over the last 25 years on average"
* of course this should say "this cherry-picked basket of small economies over this arbitrarily selected time period". 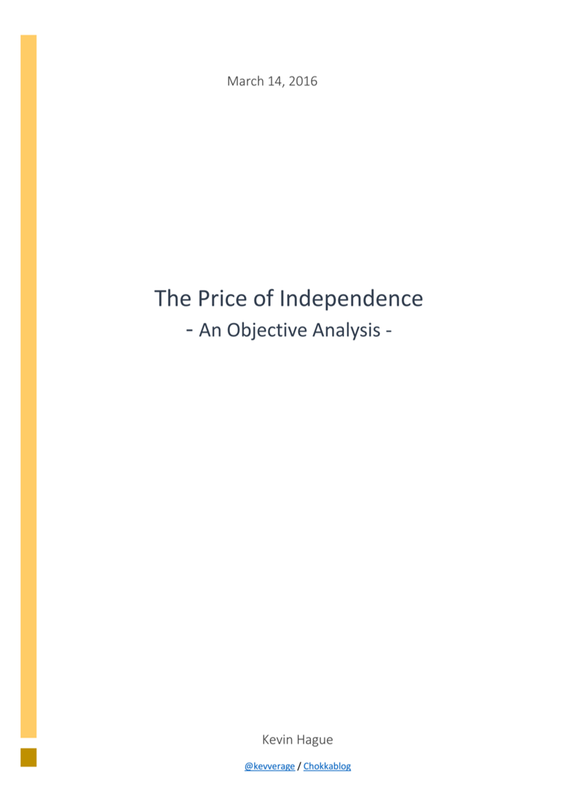 In fact, in the Independence White Paper in 2014 they cherry-picked a different basket for the same type of analysis (although over a 30 year period) and concluded that the superior growth these economies achieved "because they have the bonus of being independent" was 0.12 percentage points per year. You can see my analysis of that claim at the time here - but we clearly now live in even more optimistic times so I'll run with the new 0.7 percentage point figure. Now let's do some simple maths. 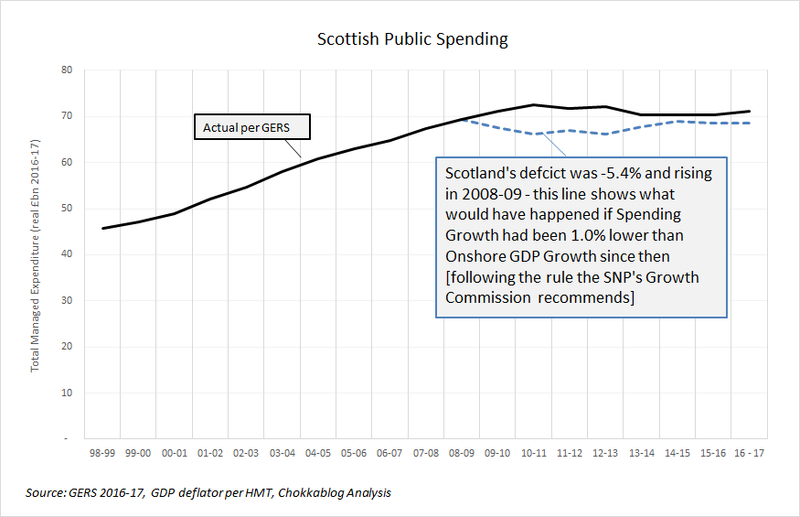 The first point to make is that the money government raises in taxes is not the same as GDP, so to get the GDP claim into a figure we can compare with figures we're used to discussing in this debate (to put it on an equal footing with GERS terms like deficit, deficit gap vs rUK, fiscal transfer, education spending etc) we have to make an assumption about the tax yield on GDP. Last year that figure for Scotland (per GERS) was 37% and on average over the last 10 years that figure has been 36%. Seems reasonable to take 37% of the GDP claim to turn it into a Government Revenue figure - so 37% of £4,100 = £1,517 per head. Multiply that by our population of 5.4 million and you get a headline figure of £8.2bn. But of course it will take a while before (aspired for) growth would deliver that figure - the questions is how long and what happens in the interim? Here we can turn back to the 0.7 percentage points per year superior growth and do another simple calculation. Scotland's tax take in 2016-17 (per GERS) was £57,952 million, so to increase that by an additional £8.2bn we'd need to grow it by an additional 14.1%. If you simply cumulate 0.7% a year growth it would take 19 years to achieve that figure. But hold on a minute. 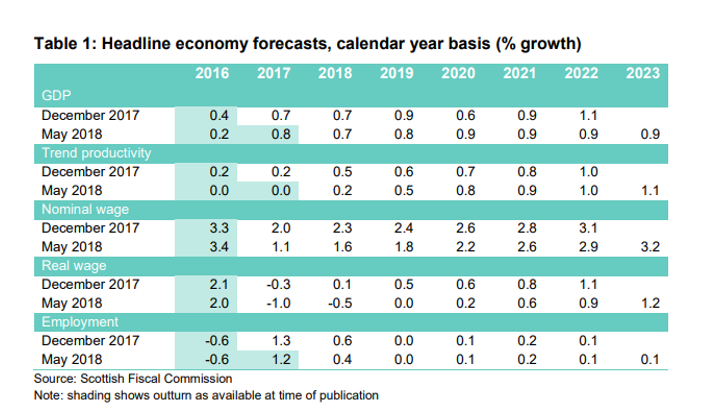 I very much doubt that the Growth Commission will claim that their recommended strategies would deliver that superior growth overnight - it would take time to get to that 0.7% superior growth figure (if it is indeed achievable). Indeed the report's author Andrew Wilson is quoted as saying "to secure an improvement in our performance will take purposeful strategic effort for over a generation". I think in this context we can safely assume we're referring to real generations, not SNP "once in a generation opportunity" referendum generations. There's more - the press release is clear that they "identify ways in which Scotland can match the success of other small countries using powers available now and with independence". 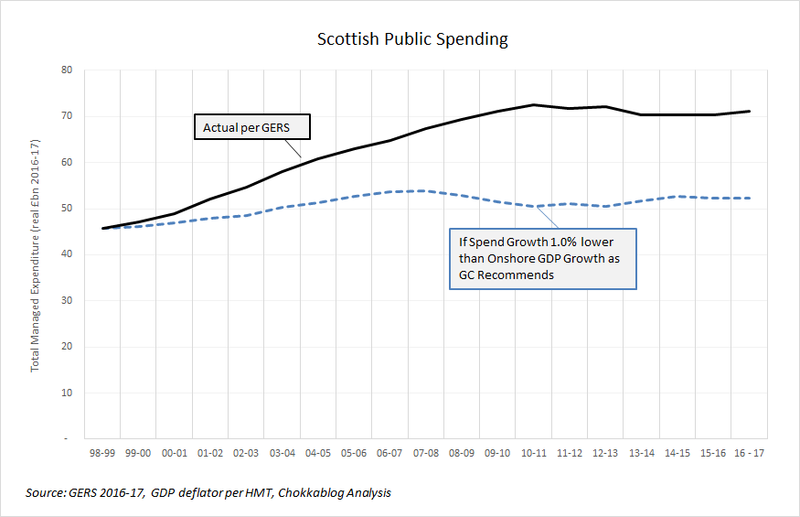 So we know that not all of that aspirational 0.7% superior growth can be attributed to independence. So pause. 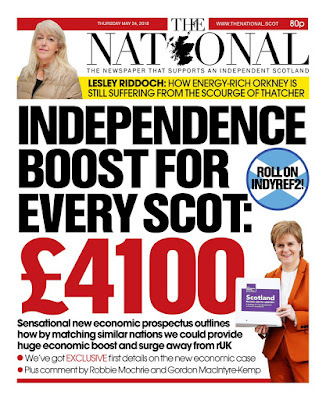 The headline "independence boost" figure isn't £4,100 (because an as yet unquantified portion of it can be delivered using powers available now), that figure is actually nearer £1,500 in Government Revenue terms anyway ... and it would take well over 20 years to be reached because growth doesn't change overnight. I'm afraid there's yet more - sorry. So far we've only talked about the uncertain aspirational upside (because to be fair that is what that the commission was tasked with identifying) - what about the balancing negative impact of separation from the UK? Even the most fervently optimistic nationalist must accept that UK-wide pooling and sharing via the Barnett Formula will cease on independence. On the most recent available figures that means the loss of £10.3bn a year in effective net fiscal transfer overnight - we won't have to wait "over a generation" for that impact. 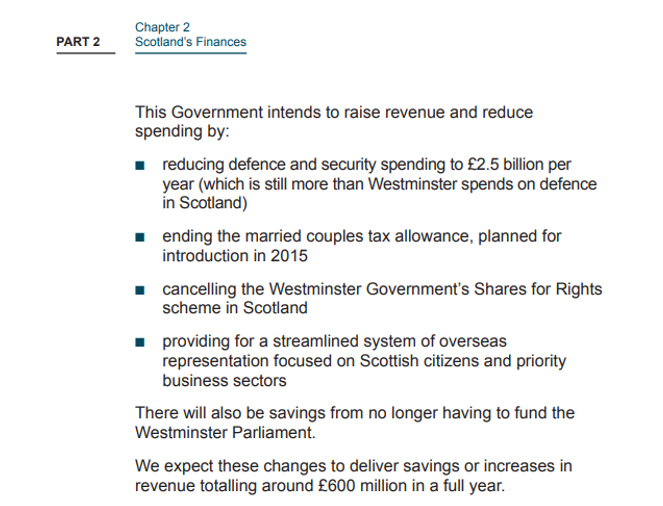 Of course there will be other changes some of which may be reductions to spending as attributed to Scotland in GERS (defence/Trident, House of Lords, etc.). 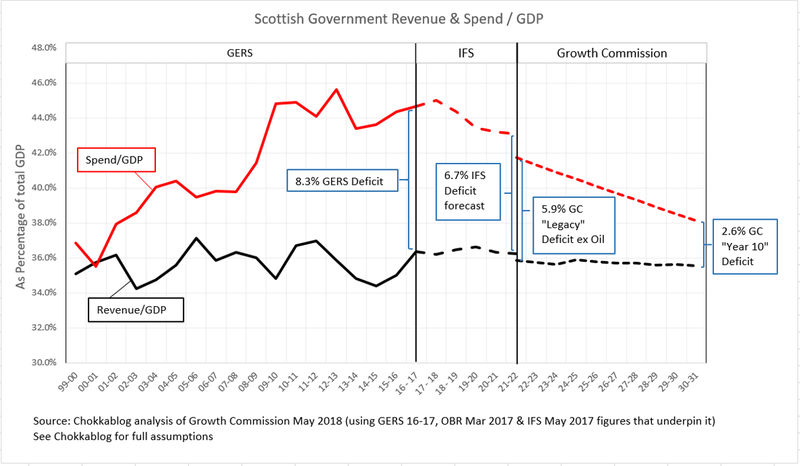 The notoriously optimistic 2014 White Paper put that figure at a £0.5bn pa saving, so even if we double that (in the spirit of this new-found enthusiasm for using numbers that are even more optimistic than the 2014 White Paper) we're still certain to be losing over £9bn of Government Revenue on day one of independence. 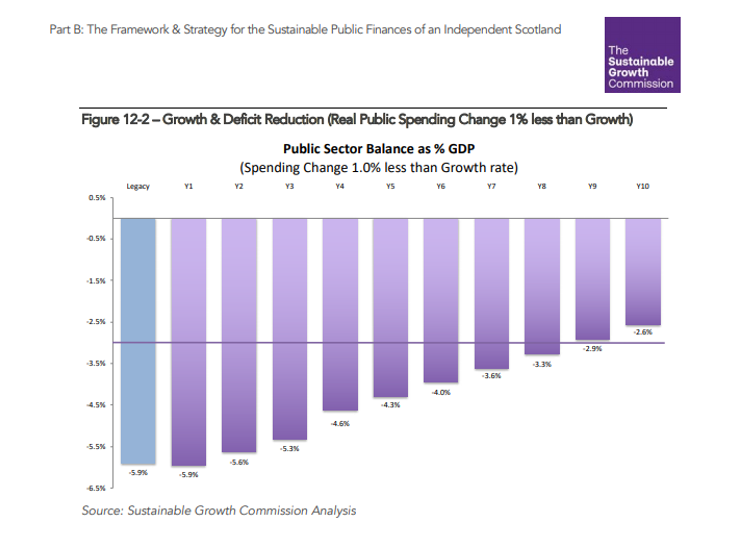 So the portion of that £8bn from growth attributable to independence (as opposed to using additional powers) - which will realistically take more than 20 years to achieve - will necessarily be less than the at least £9bn we'd lose on day one. It gets worse, because we haven't even started to talk about the "Brexit-esque" impacts of leaving the UK single market. Scotland trades 4x more with rUK than we do with the EU - if one accepts that economic disruption is inevitable for the UK leaving the EU, it logically follows that greater economic disruption would result from Scotland leaving the UK. This is an essential point - the loss of Barnett and the inevitable disruption to our economy that separation from the UK would cause would dramatically reduce our financial capacity to invest to grow our economy. It would reduce our capacity to invest in public services like education (probably the single most important way to grow our economy in the medium to long term). Let me be clear that the preceding is not a critique of the Growth Commission report (how could it be, I haven't seen it yet) but an interpretation of the headline's offered in the press release. If I discover that any of my interpretations above are wrong when I finally get my hands on the full report, I shall of course return to this blog post and amend/correct as necessary. I'm pretty confident in my conclusion though: I think The Growth Commission will have delivered a report which - when the contents are fully digested - will show that a vote for separation from the UK would be a vote for generations of economic hardship in Scotland in return for an extremely uncertain hope of a brighter economic future for generations to come. My suspicion is that the report's authors grappled with this harsh reality and wanted to focus a significant part of the report on how our existing powers could be used to make our lives better within the UK - quite possibly it is arguments over that which have delayed the report's publication for over a year.